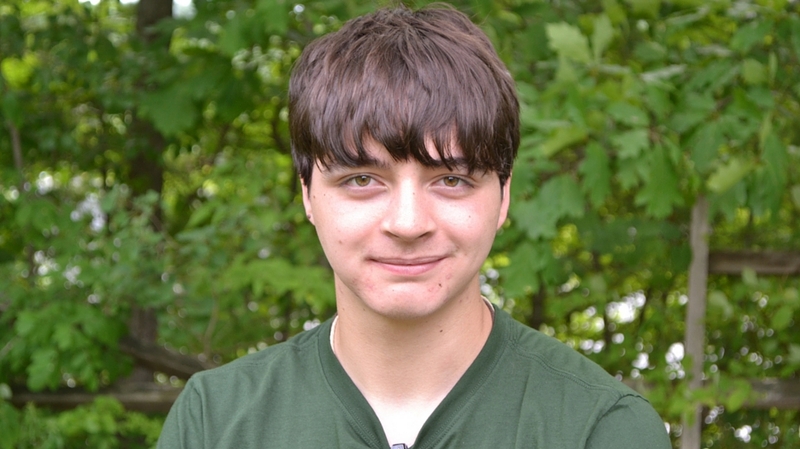 From the tropical beaches in the Bahamas, Josh, a Bucktails and Ursids alumnus, writes about the amazing life he witnessed in the clear blue ocean. 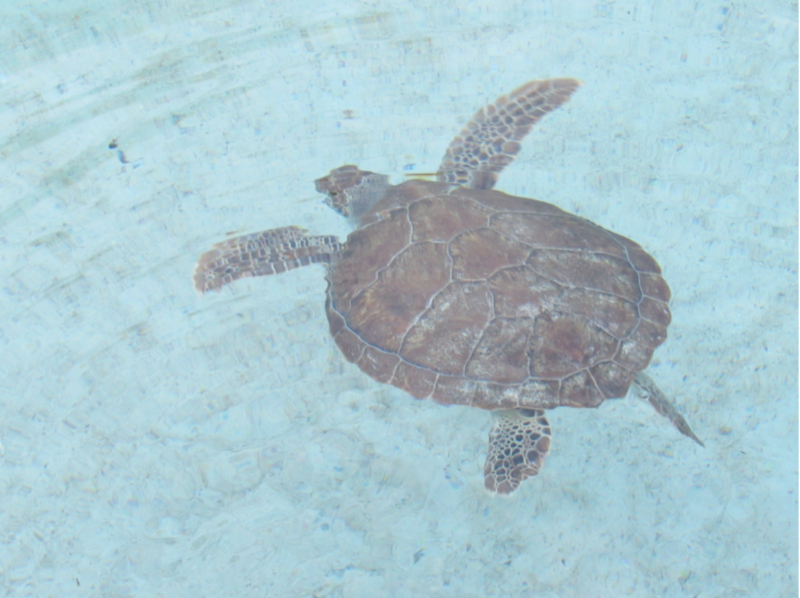 Dive deep into this blog post to learn about the Sea Turtle Rehabilitation Facility in the Bahamas! In my recent trip in the Bahamas, I was hoping to find a lot of marine life through swimming and diving and I did not leave empty handed. I saw plenty of amazing sea animals including eagle rays, reef sharks, and even some bottlenose dolphins. I saw some sea turtles too but only the ones that are a little far from home. The sea turtles I saw were being held at a Sea Turtle Rehabilitation Facility because they were facing some situations that lead to a desperate need of help being restored back to health and then released back into the wild. That is what the facility is all about, rehabilitating disabled sea turtles and releasing them back into the wild. 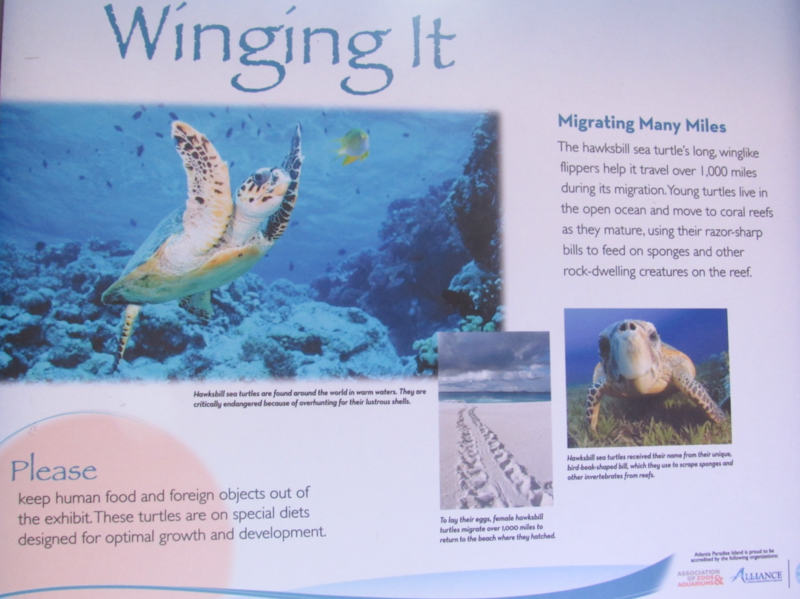 The Sea Turtle Rehabilitation Facility not only helps out sea turtles, but they also provide education about them to visitors and that includes plaques that provide information about the turtles. The Sea Turtle Rehabilitation Facility is a program that takes care of sea turtles that recovering from injuries, sickness, or from being too comfortable around people. What happens is that people would leave plastic bags in the shore and since jellyfish are the main food source for sea turtles, they often mistaken they as food and that always becomes a choking hazard for the turtles. Also, some people who go fishing are careless enough to leave their fishing hooks, nets, and lines in the water or on the shore where the turtles can get tangled up which leads to another life threatening situation. Another situation is that when sea turtles hatch, they can sometimes get confused on where to go and eventually end up being around people and not learn how to live in the ocean. All of these reasons are a few which makes sea turtles endangered and that is where the facility comes in to help them out. A juvenile green sea turtle gets use to being around a marine environment by swimming in a lagoon that imitates the real environment. The facility has a team of veterinarians, aquarists, and marine biologists who rescue these sea turtles and restore them back to health by holding them in manmade lagoons and fix whatever kind of condition they have either it is an injured flipper, a choking hazard, or in need of learning how to live in the ocean. Unfortunately, there was some sea turtles with permanent injuries would have to forever remain in the lagoons. The sea turtles that are being taken care of at the facility were the most common ones in the Caribbean which are the hawksbill and green sea turtles. The differences between the two species are their shell patterns are their beaks. Green sea turtles have a hexagon pattern that runs down the middle of their shell with a flat edge while hawksbill sea turtles have an arrow shaped pattern running the middle of their shell with sharp plates at the edge of their shells. Another difference is the beaks, green sea turtles have dull beaks and hawksbill sea turtles, just like the name, have a sharp beak like a hawk. Both of these species are endangered mostly because of the reasons I mentioned, and also because people would take the eggs for food or hunting them for their good looking shells. Both of which are illegal but continues on. 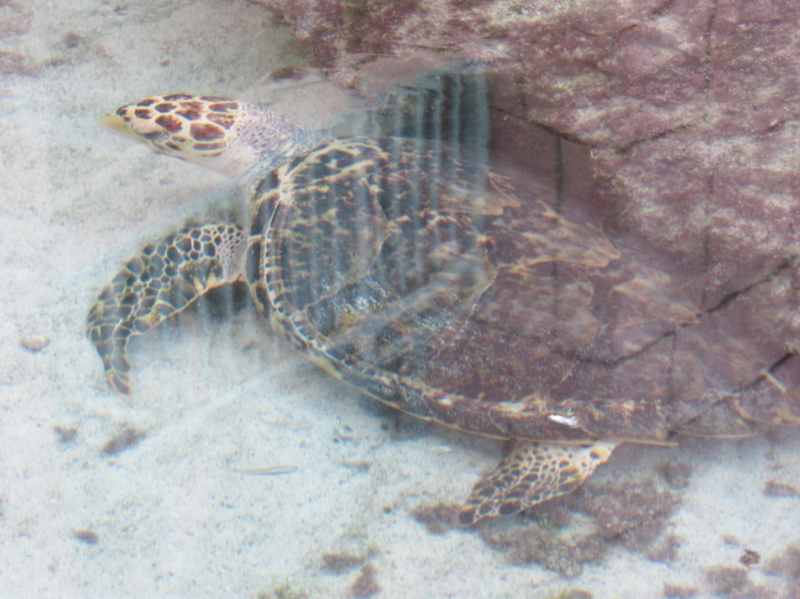 A hawksbill sea turtle lays and recovers after being restored to health and before being released out into sea. The facility does all it can to save the turtles and everyone else can too. It’s actually pretty easy because if we simply do not leave trash on the shore and we if don’t disturb the sea turtles, they would have a better chance of survival. I do my part in helping these turtles by simply doing that, and I recommend everyone else to do the same, mostly because when I go swimming and diving in the sea, I like seeing a lot of amazing sea animals, like the turtles, roaming in their habitat. ← Where Did All the Wildlife Go?